What the Trapeze Artist Trusts pieces together a story, a world where personal boundaries are challenged, where the speaker seeks to redefine trust and erase doubt, and invites the reader along for a mesmerizing adventure of self-repair. Albrecht’s poems call upon sirens and mystics, otherworldly selves, and the world of dreamscapes to voyage through the past, the present, and the unknown future. What does it mean to keep silent? What does it mean to trust another? 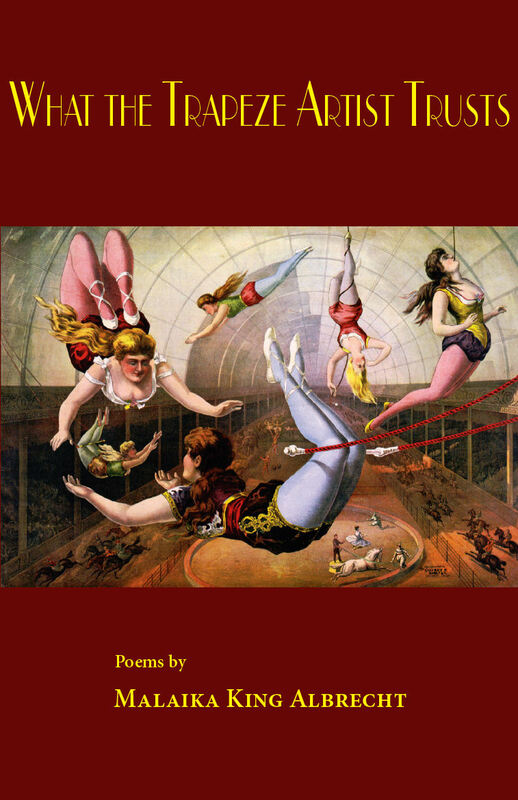 These questions are explored in What the Trapeze Artist Trusts as the speaker navigates dreams and memories, digests choices made, pasts rewritten, and considers what her future holds. At the heart of these poems, the speaker seeks to redeem herself for the grief experienced in loss, with an eye to return with a stronger sense of herself, again capable of loving and trusting another. no longer breathe next to him. Albrecht’s speaker faces the past head-on and while she never pities herself for all that has been lost, she embraces what she knows of the truth, analyses the void left by the ache in her heart, and continually pushes to resurface as a stronger being. In “How to Walk Right Through a Woman,” the speaker recalls how her relationship was once secure, how “one day / he held my hand, and then another, // my hand slipped through his like sand.” The speaker offers no explanation for why love leaves us, how trust declines, or how a bond is broken. It just is. It happens despite our best intentions. After love ends, when trust has been broken, and a heart must mend, the speaker works her way through pain into recovery. She alone builds up her heart again, opens herself to being whole and trusting again for her own sake, putting herself at the forefront of her life. won’t be coming back as me. She cannot be who she once was as that person no longer exists. Instead, she is a new, stronger version of herself. This revelation, this rebirth, comes to life in “How I Came to Me,” as she sings “No longer am I dispossessed / or repossessed.” The speaker sheds her former skin and regains her strength, declaring “I will jump / and I will fly,” firmly stating she has again filled herself with a sense of calm, a renewed sense of self-worth.